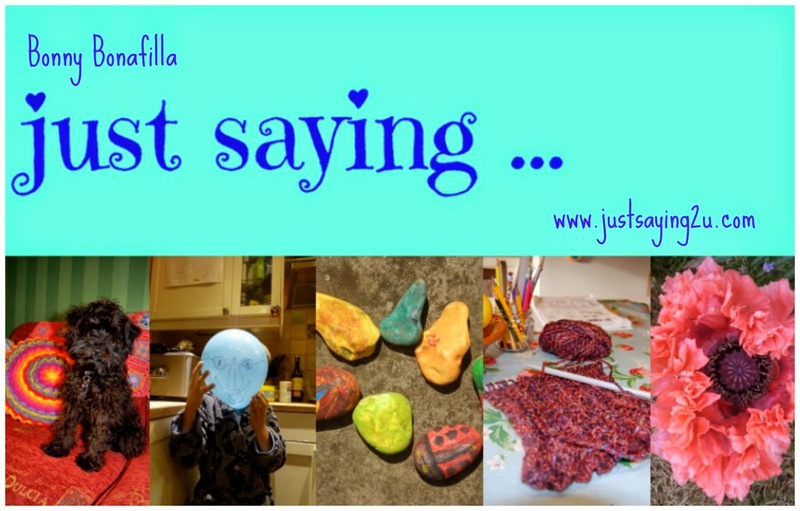 Does the weather influence how you look at colour? I find that when I’m in Spain I always chose bright, cheerful colours. Back home in London my choices tend to be a bit more restrained, but over on the Costa Brava I’m drawn to the big sunshine colours. And you can see the influence of that big Mediterranean sun in this new dotty, spotty bag that I’ve just cast-off. I've lined it with a contrasting lawn cotton so that all the woven-in ends aren't visible when I open it. 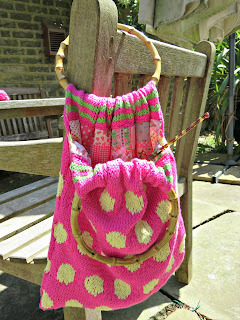 It's really quick and easy to make: perfect for a weekend with your needles out in the sunshine. Just read on for the pattern. 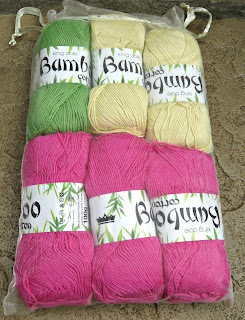 It is worked using King Cole Bamboo cotton in double knitting and single point 4mm/ UK size 8 needles/ US size 5 needles. My tension working on these needles came out pretty close to the recommended 28 rows and 22 stitches for a 10cm square. The colours that I chose were Fuchsia/ shade 536, Lawn/ shade 653 and Safron/ shade 637. 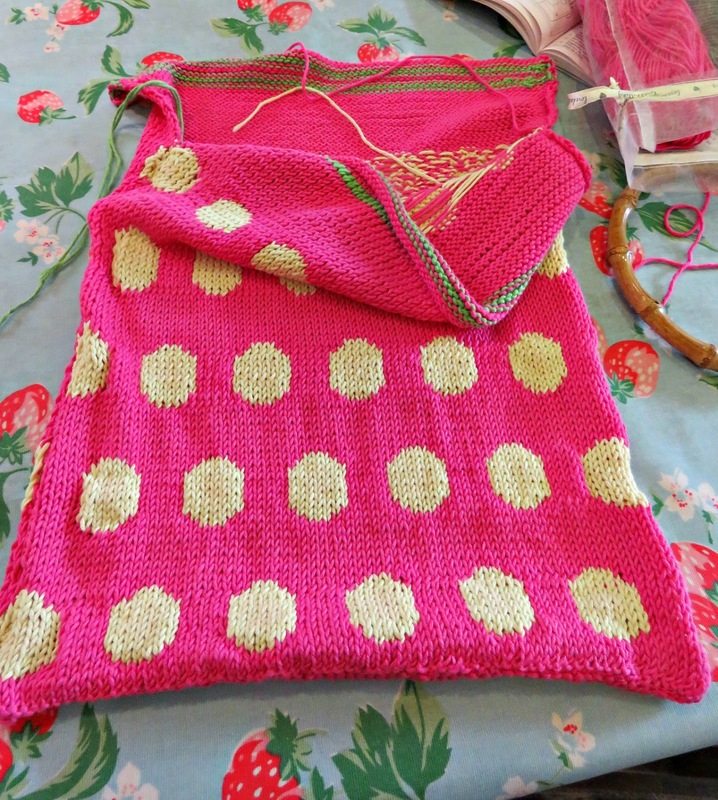 To make a bag that's 35 cm deep and 32 cm wide you'll need about 100 g (252 yards) of the main colour (pink) and of the contrast dot colour (yellow) and 50 g or 100 yards of the third colour (green in this case). 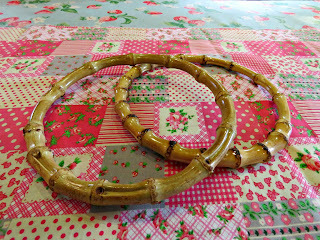 I’d ordered them online and, whilst they weren’t exactly how I’d expected them to look when they arrived, I was lucky in that still they worked quite together well. I struggle a bit with the colour charts on the internet: they don't always seem to be accurate when the wool arrives. Do you have that problem too? Anyway if you'd like to get to work you'll need to cast on 73 stitches using the long tail cast-on method. 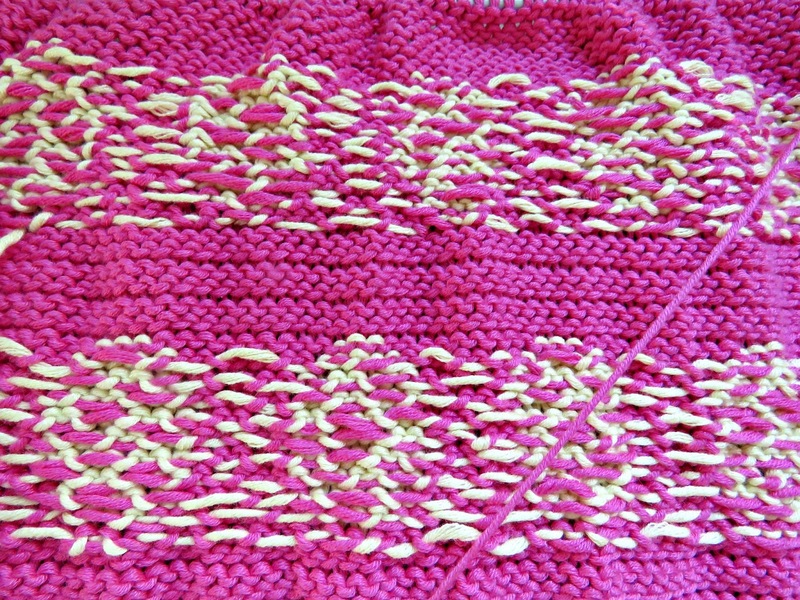 The pattern is worked in knit and purl (stocking stitch) from the chart, without any increases or decreases, changing colour as shown. Remember that when working the knit rows you will have the right side facing you and you will be following the colour chart from right to left, and with the purl rows you will have the wrong side facing you and you will work the chart from left to right. 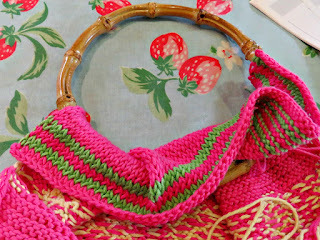 You could work this pattern in either Intarsia or Fairisle. I’ve got a strong preference for Fairisle over Intarsia. All those little bobbins for the different colour-blocks tend to emerge from my handbag looking like the Wonder Dog has been chewing them, and then it takes me an age to get them all straightened out and smartened up before I can get down to any knitting. So, given my personal preference, I did this in Fairisle, taking care to carry the dormant colour across the back of the stitches so that I didn’t end up with lots of long hanging loops. As a rule I weave the dormant wool into the back of the active stitches on every third stitch so that it doesn’t make a nuisance of itself. This produces a nicely tensioned, well-behaved textile that’s easy to work with. The pattern repeats over a total of 34 rows. Work 2 pattern repeats (i.e. 68 rows). Then follow the pattern again for the first 19 rows of the chart (this will take you to the row before the lower edges of the second row of dots) i.e. you will now have completed 87 rows in total. 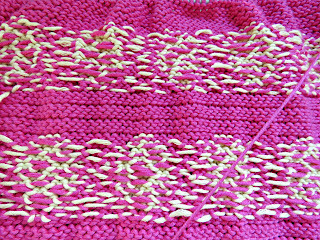 Carry on in stocking stitch in the pink yarn for another 9 rows. Change to the green wool and work 2 rows in green. Change to pink and work 2 rows in pink. Change to green again and work 2 rows in green. 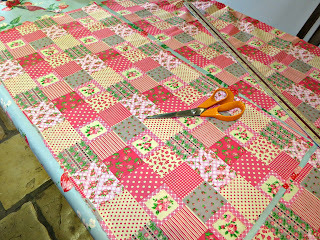 Change to pink and work 2 rows in pink. Cast off. Tah-dah! You’ve made one side of your bag. Now carry on and knit the second side in exactly the same way. When you’ve got the two sides knit, weave in your loose ends, and block them. I do this by placing a towel on my ironing board, folded over so that I have a double or treble thicknesses of material to pin my knitting to. Then I pin the knitting so that it’s a nice straight rectangle without any curling edges. I use my iron, tanked up with some scented ironing water to keep things smelling wonderful. With the steam setting turned up to maximum strength I move it slowly over the knitting, hovering just a few millimetres above the textile, but without actually touching it. You want the knitting to be steamed without getting singed in the process. Then I just leave it for several hours – or overnight if possible – before I unpin everything. 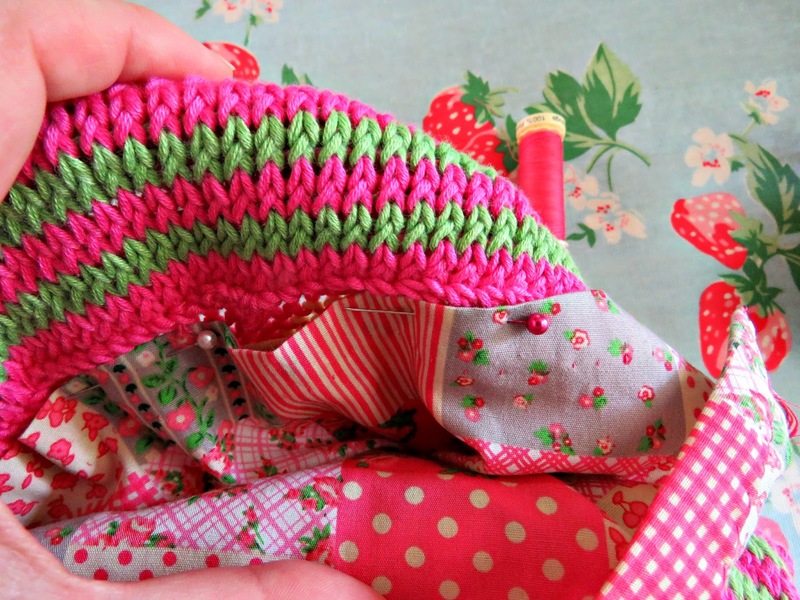 When I’m done I have a very well-behaved textile that doesn’t curl up around the edges. Using the correct colour of wool to produce invisible seams on each colour section, sew the two knitted sides together, right sides facing, and take your side seam to within 6 cm of the top end of the bag. 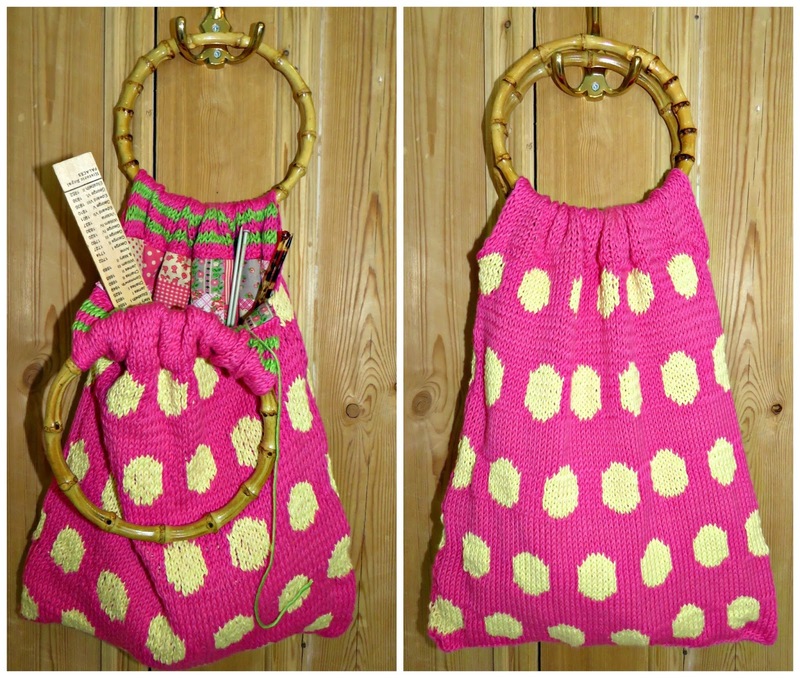 Do not sew this last 6 cm of the knitted fabric as this will be used to wrap around and sew-in the round handles. When you’re done with the side seams turn the bag so that the right sides are on the outside. Now it’s time to attach the handles. I chose simple circular handles of approximately 17 cm diameter, made of a bamboo that was dressed up to look like some sort of horn. Maybe I'd had too much sun, but they looked a bit Gucci to me. 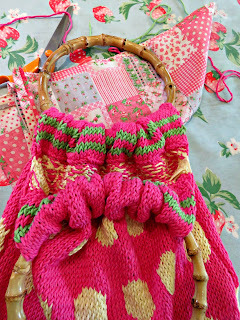 Wrap the top of the bag around the handles (see photo below) and stitch it down. I stitched the pink cast-off stitches to the back of the pink stitches on the row above the last pattern row of yellow dots. All of the green lines are on the inner side of the bag – my idea being that they would only be visible on looking into the interior. And then sew the other handle into the other side using the same technique. Now you’re ready for the lining. 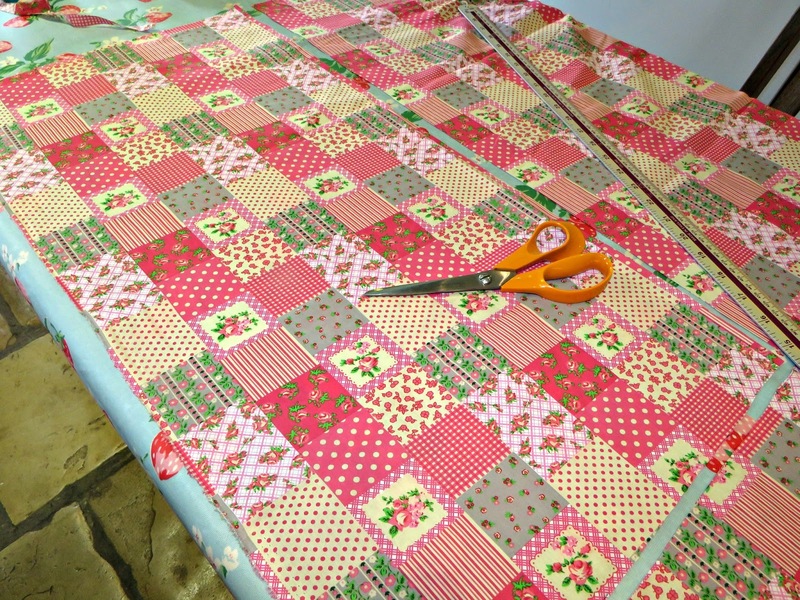 Cut the lining fabric in a rectangle 38cm wide x 76 cm long. Using an overlocking stitch run a row of stitches all the way around the perimeter of the cloth to secure the raw edges. The idea here is really simple: I’ve allowed a 1.5 cm seam allowance all round, which we’re going to use to produce a simple fabric envelope to insert into the knitted outer casing. All we have to do is fold the rectangle in half, and sew up the two sides to produce the desired effect. Fold the rectangle in the middle with the right sides facing one another to produce a double-thickness square that measures 38 cm x 38 cm. Now pin and tack the two sides of the rectangle to within 6 cm of the upper edge. Sew these side seams and, using your iron, press them open into 2 flat seams that run to within 6 cm of the upper edge. 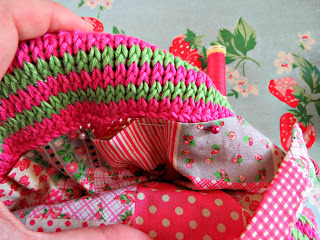 On the upper edge, work a rolled seam of 3cm (1.5 cm turned over), and finish off by hand using a simple row of blanket stitches on the wrong side. This will produce a liner of the same depth as the knitted bag. 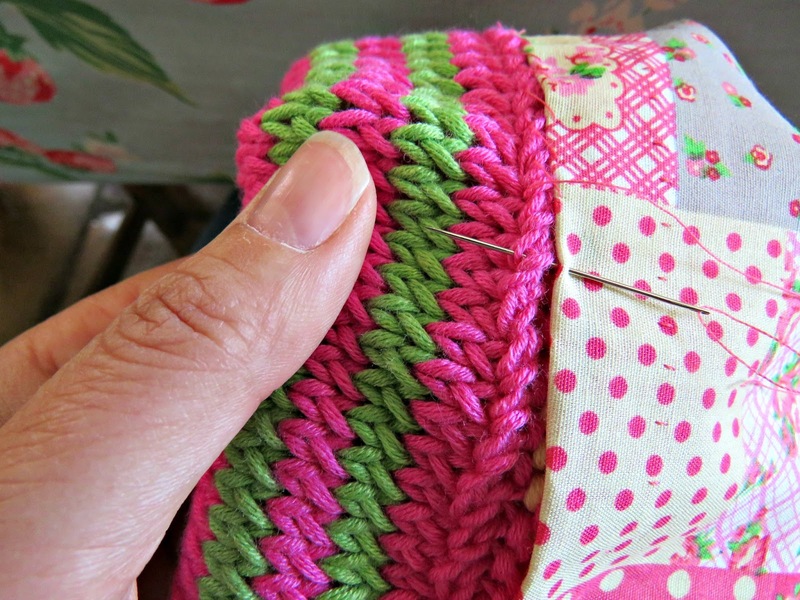 Insert your lining into the knitted outer casing of the bag and finish off by sewing it in place using a simple row of rolled stitches to secure it to the folded over edge of the top of the knitted fabric. The right side of the lining will form the visible inner lining of the bag. You may have to rip the side seams a little to get the lining the fit. Just rip back as far as you need to, and secure the side seam with a few hand stitches to prevent it from unravelling any further. And that’s about it. Ta-dah! You’re done. 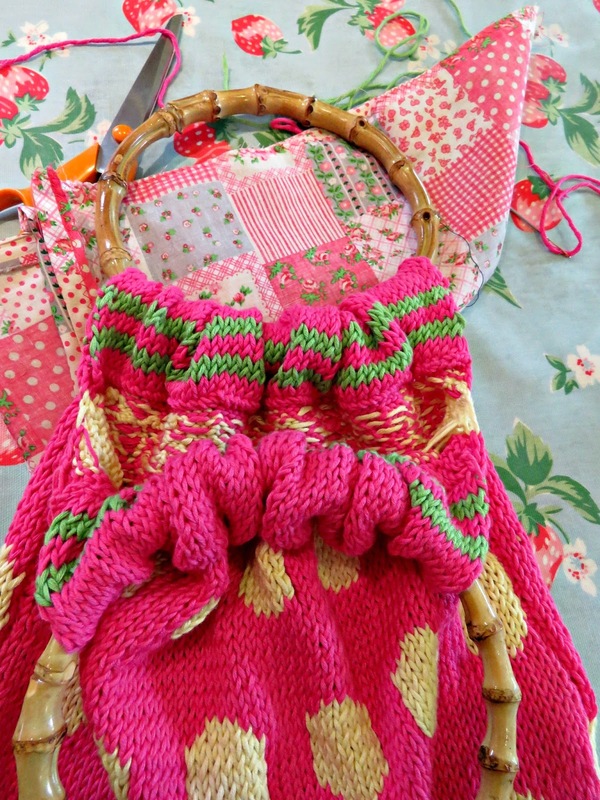 Now you’ve got a cheerful bag to carry your next project around in.